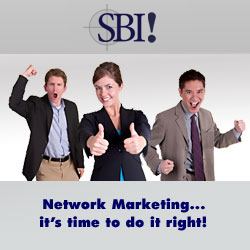 Online SBI and Network Marketing. The Perfect Business Marriage. Online SBI and Network Marketing. When I started applying online SBI (Site Build It) tools with my | Network Marketing company, I realizes it was the perfect marriage, it is the perfect business combination. The Internet and Network Marketing goes together hand in-glove, however Network Marketers have struggle to realize the full networking, lead generating potential of the web. I have been using Online SBI for over three years. I took the course three times, the first time I got the basics, and then I realize that it was perfect for my MLM business and then I found out that the course will be giving again in a location close to my place. So I took it again and again, by then I met more people with the same interests, so we decided to continue, getting together twice a month, at a Burger King ,. in our area where they offer us free internet connection. I believed is important to support each other and exchange new ideas related to online SBI and today I have more than 100 pages of information on how to lose the last stubborn 10 pounds about portion control and food combinations that I am still using and I have maintained my weight loss and teaching people how to cleanse, only that because I realize that is what people are looking for, so I gave to them and on my site I don`t talk much about MLM or the business aspect and I only do it after, if I see some interest from their part. Online SBI, over delivers on everything. You get your moneys worth and also give the opportunity to be around people just like you, I met some wonderful people ready to help you you know why? Because they want you to succeed to achieved your goals, you see we are not young people and a lot of us don`t know much about computers and for your information we have a lot of grandmothers and grandfathers in Online SBI. You probably found this site by using a search engine. Well that's what Online SBI helps me with. It showed me how to build pages that rank high in the major engines so I can get as much free traffic as possible. SiteBuildIt! has been around now for about 5 years. SiteBuildIt! is simply the best way for someone to become familiar with "how it all works" regarding all the aspects of making your site visible and successful. The phenomenal results gained by those who use it are the proof.. The Site Build It! tool has more than met my expectations. It's C-T-P-M method is even more straight forward, and makes the keyword search tools even more powerful. Online SBI is a user friendly site building "all in one" package that allows you to concentrate on your actual business (whatever the theme might be) and not have to worry about all the technical aspects of creating an online presence. There is a potential way to make a living by making your specific knowledge highly visible, then by monetizing this knowledge. To do this, you need to make your web site...and SiteBuildIt! is really the best way to start, to get you on the road towards your success and your financial freedom. SBI has showed me how to earn a profit with Google ads and other affiliate programs.Google has a program called Adsense, and it allows you to help them advertise by placing text ads on your pages. You may have seen them while browsing the internet. Every time someone clicks an ad and visits one of the advertiser's sites, you earn revenue because Google pays you a share of what the advertisers pay them for that particular ad. Do you have the solution to a problem that can help people? Personally I have been involved in direct selling since 1983 and to me this is a blessing because I don`t have to depend on anyone. A lot of my sales are doing directly from my site, through my links and contact page and if I can do it I`m sure anybody can do it. Here are some very good sites done by people just like you and me I know because we took the course together Tanya is helping others in a very unique way. ... Dade has a guide to improve your photography skills... Frank and Sheska, have a place where you will find clarity and balance. and Marie-Berthe Leblanc, Professional Massage Therapist. My ultimate goal is to give you genuine information, suggestions and techniques to build a strong and meaningful quality of life. The topic can be anything. Just make sure you are passionate enough about it to build a useful, informative site - otherwise you'd get bored and abandon it. Problem-solving sites make the best kinds of sites because people often bookmark them and tell others about it. Do you have bilingual friends? If you do, we may have a landing page that speaks their languages. What a better way to convince your friends that you want to help them than to tell them about SBI in their home language. What I do today give me a sense of security, you have to have a dream so you can get up in the morning. You should try it. I wouldn't recommend it if I didn't use it myself. My advice is to do what I did and pick a topic that you have a personal interest in. Every time you present this site to somebody and that person signs up you get some money and also when they renew. That`s remind me an old saying " When the student will be ready the teacher will appear." Are You Ready?????????????? That reminds me something that I read a few years ago from Joe Girard:The elevator to success is out of order. You'll have to use the stairs... one step at a time". SBI people build success one block at the time. Any questions regarding Site Sell please use the The Contact Page. from this " Online SBI" page.